2017 is coming to an end and I am already expectant of all that God is going to do in 2018! There are several launches of FireBibles in store and I can’t wait to share them with you as they occur. We will kick off the new year with our first launch happening in January in Northern Myanmar for the Lisu FireBible. As you can see from the Biblical text, the characters of the Lisu language are absolutely unintelligible to us, just as our Bible in English would be unintelligible to them as well. The Lisu FireBible will give many tribal pastors, leaders, and believers the opportunity to read and understand the Bible for the first time in their own heart language. 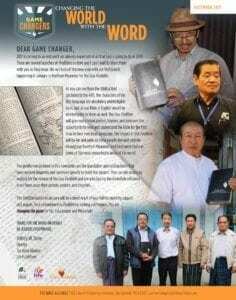 The impact of this FireBible will be far and wide as these people live and migrate throughout Northern Myanmar and Southwest China in some of the most unreachable areas of the world. The gentlemen pictured in this newsletter are the translation and editing team that have worked diligently and sacrificed greatly to finish this project. They too are anxiously waiting for the release of the Lisu FireBible and are anticipating the incredible influence it will have upon their people, pastors, and churches. This FireBible launch in January will be a direct result of your faithful monthly support and prayers. Your commitment to FireBibles is making a difference…You are changing the game for the Lisu people and Myanmar!